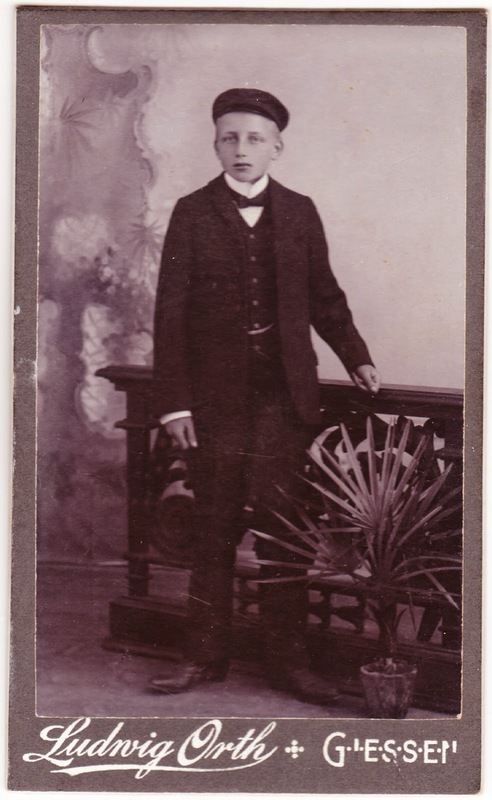 This vintage photograph featuring a well-dressed young gentleman measures 2½ inches wide by 4⅛ inches tall. It was taken long ago at the Ludwig Orth photography studio in Giessen, Germany. Giessen, in the central part of the country, began as a castle in the 12th century. Its University of Giessen dates to 1607. More than half of the town was destroyed by bombings during World War II. It is now home to about 76,000 residents and 24,000 university students. This photograph — a small cabinet card, really — has pre-printed information about the photographer on the back. The largest text states "Ludwig Orth, Atelier Fur Photographie, Giessen." Atelier Fur Photographie translates to "studio (or workshop) for photography". There is, however, no indication of who the young man in the photograph is or when the photograph was taken. Tomorrow's final "Pics from the past" is from this same photo studio.